Fascinating 3D printer at MIT printing with molten glass. 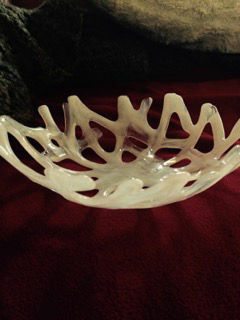 The Livermore Art Association Gallery newest member, Susan Principe, is a glass artist, born. The 4th generation Californian, trained and learned about glass mostly in the Bay Area. Her interest in glass began in the 1980’s when she began working with stained glass. After a short hiatus Susan was able to devote time to working with fused glass. Susan says she finds glass to be a fascinating medium – the possibilities for design, shape, color, additives can be limitless. Glass can be clear or opaque, white or black (and every color in between), functional or non-functional, strong or fragile. It can be shaped, draped, slumped, nipped, stacked, combed, molded, sandblasted, etched ... and the list goes on. She says that her inspiration is provided by the world around - shapes, colors, and angles of nature and architecture can provide inspiration at every turn. All of her work is one-of-a-kind, and, with the exception of some hardware attachments, all material used is made in the U.S.A. Her work can be seen at the LAA Gallery, 2155 Third St., Livermore. Hours are 11:30 to 4, Wednesday through Sunday. Admission is free.